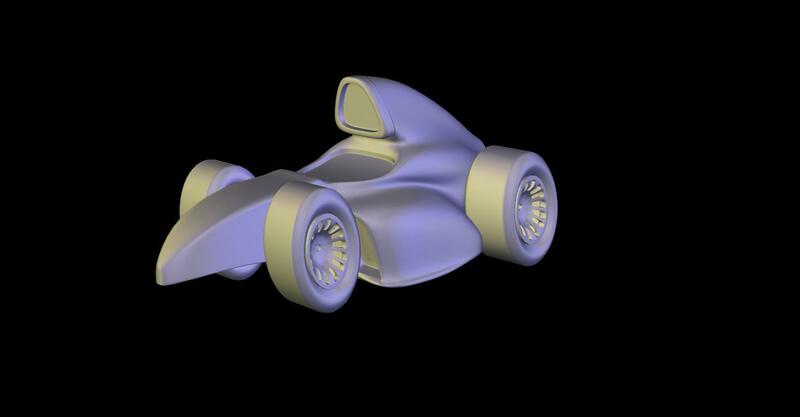 I started modelling the F1 racecar last night. I find it impossible to sit around and chill if there is something to do. So I worked on 3d modelling the car last night. I want the car body style to be non-specific, the graphics will be the identifier on this. This is close enough, and pretty generic. 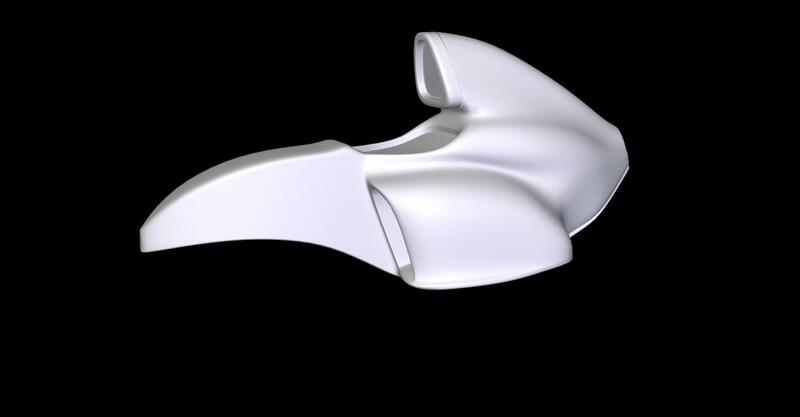 I brought it into PS and distorted it a little to more resemble the overall shape I want. I love the fact the wheels are oval, and will probably lean them forward for a speedy look! It will definitely look inspired by those cartoon looking cars that people modify in Photoshop. I thought about sculpting it from epoxy putty over a blank, but this car has to look pretty slick and shiny, and our Techno excels in that department! I quickly massed out the body in Hexagon, using the reference image as some sort of guide. Because we might get to make this one, I'm paying attention to how I might machine this, and modeling it with this in mind! With the smoothing applied to the model, it's looking pretty sharp. Now I wish I could drive it around! It probably wouldn't comply with F1 standards, but it sure would turn some heads! Once the wheels got modeled, my excitement quickly grew! This is gonna be saweet! Those are some pretty slick Goodyears. 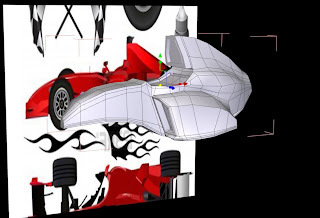 The only thing really left to do now will be to add the details like the spoilers and suspension components, as well as the over sized drivers head. Someone has to be in control of all that horsepower! Oh, wait till the ladies see this in my driveway! Tonight's post is a pretty quick one! We delivered the prototype for the current show we're working on safe and sound. Once that gets a sign off, were on to a whole bunch of them! Not a lot of tough work to them, but they'll be kinda fun to make. While we were moving some stuff around to accommodate the build, I found a sample piece I did a couple of years ago, but never got it finished! Not sure if you remember this from awhile ago, but it was a bit of a time capsule for us! I decided that there was no point in keeping it if it wasn't going to get finished. So, we got to work right away making it rusty. Working for film and television allows us to try, try, and try new stuff that we wouldn't normally do. The rust that we use is kind of something that we were forced into in a pinch. We were dealing with a super short deadline a long time ago and had ordered the waterbased paint that rusts with an activator applied to it. No big deal, as you can order it easy enough. BUT.....when we needed the commercially available stuff right away, it got held up in customs....for a week! This led to improvising in a pinch. Knowing how the rust paint is made, we decided to duplicate it as best we could. This led us to painting the part with a dark grey latex paint, then dusting the surface with iron powder that we already had lots of. We could have put it in the paint, but we decided to go right to the surface to save powder, and time. We learned alot on that job, and decided to apply the exact same thing to our newly found piece! 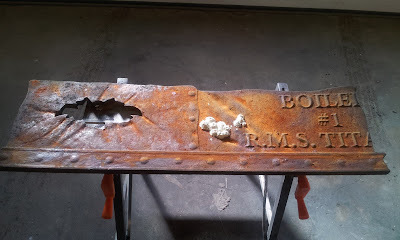 We sculpted some barnacles to add to the look, although I don't think barnacles are around where the Titanic lies, but it's kinda fun! while the piece was hiding for 2 years, it developed a nasty warp to it, which makes it look even better now! 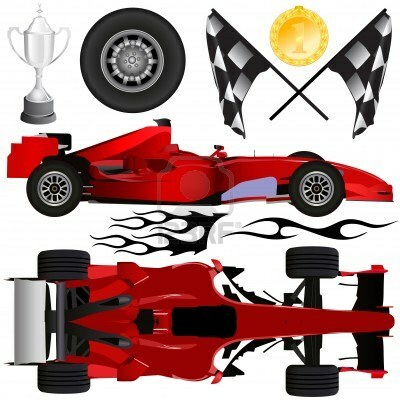 Tomorrow I start modelling a cartoon F1 car for Grand Prix Montreal. 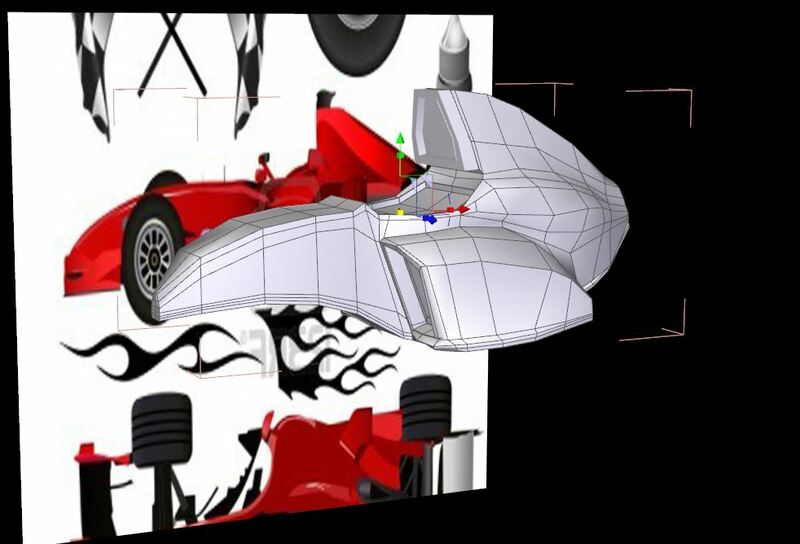 So far we've only been asked to model it, but who knows, maybe we'll get to build it for real! While we're working on our current show, we've also been working on finishing alot of the small self-projects that are piled up around the shop. 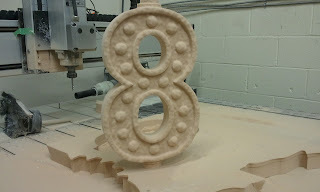 A while ago we started the number 8. This was going to be hung up at the back door of the shop, so our unit could be easily found amongst all the other loading doors! This was cut from 2" HDU, and was double sided machined. I only had to draw 1 side in Aspire. I just ran the file, then flipped the part, and re-ran the same file. Pretty straight-forward. But fear not..........we're picking up from that point now. The main reason for this particular piece, locating our shop aside, is to test out our metallic powder treatment outside-facing south. A good test for sure, as south is the toughest facing location for a sign. It can change over 10 degrees in a couple of hours in the winter, then bake and fry all summer long. The plan is to created the sign as usual, do the powder thing, then only clear-coat the bottom half. Then we can keep an eye on it as it ages. 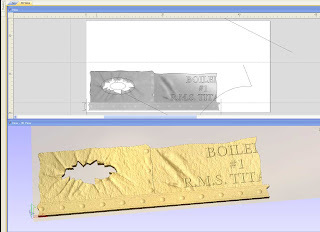 We use this treatment quite a bit for film props, but it would be a great alternative to gold leaf on a sign. Especially as the Pearl-X powders claim not to tarnish outside. Finally, polished copper letters outside, staying bright forever! I always get asked how we do the powdered metallic treatment on our different projects. It's really quite easy, once you try it! I decided to shoot a short video of Jody using the technique, so you could get a good clean idea of the process. Before the video was shot, we applied a good couple of coats of gloss black enamel. We use Tremclad gloss black for this. The process doesn't work nearly as nice with water-based paints, as they dry WAY to fast. The smoother and glossier the enamel coat is, the brighter and shinier the metallic finish is. This process works with all metallic colors. The other major player is WHEN to apply the powder. The paint has to be dry enough to not come off on your finger, but still a bit grabby. The stickiness is what glues the powder down. And as this is a polishing kind of application, it lays the metallic powder particles down flat, becoming as much like real metal as possible. This is why metallic paints like copper and gold don't look like the real thing, when they spray out of the can or spray gun, the micro-flakes get deposited randomly, not uniformly, resulting in loss of real metallic sheen. 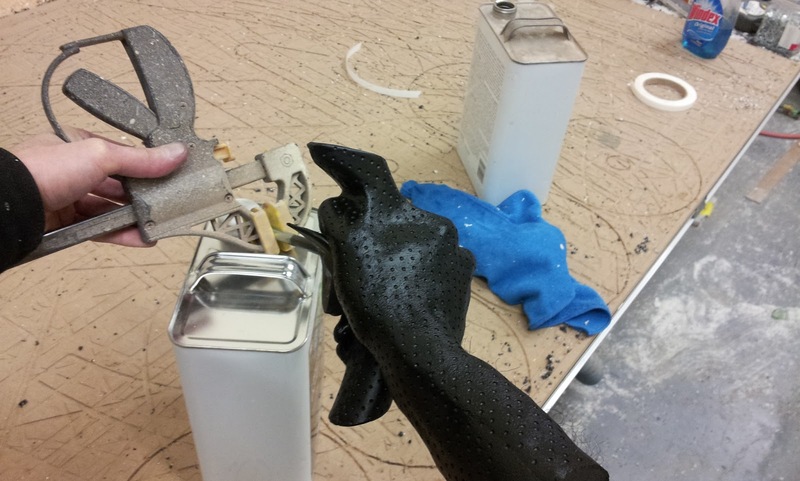 If you find that buffing the powder isn't resulting in a super shiny metal, try letting the paint set up a bit more. 20 minutes can make all the difference! We returned un-scathed from our trip down to Techno CNC routers in New York! For those who were unable to make it, maybe next time! The drive down was great! Jody and I love road trips, and this one was no exception. To be surrounded by Techno routers is pretty exciting for me. Imagine...........any router you might decide to use is available and waiting. It was a pleasure to meet everyone who came out, and to get a chance to discuss cnc, marketing, and creativity! Roy Valentine was present during the whole event, and was able to answer any technical questions, and Dee Loebl deserves an award for organizing it and having it fly without a hitch. We also got a chance to hang with Ken McBride, Techno's Application Engineer. This guy is one super cool cat! I'm betting he might regret giving me his direct extension number:) Techno has some of the greatest people working for them! As this was a short-run event, about 4 hours, we crammed a few thing in. Ken covered basic nesting, pocketing and Techno's new ADA compliant braille insertion tool. I also went over our process for cleaning up dimensional text. This has become a staple of mine, as I regard it the most important part of sign routering. Especially on complicated, texture laden signs. 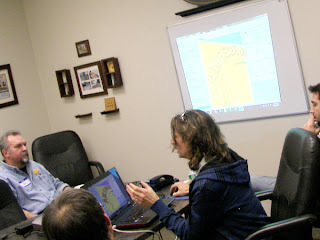 Unlike most other times teaching this process, we were able to run the files right after the computer part, enabling everyone to see exactly why we were doing it this way! This was such a great time for me! We are planning to put together a 3 day version, hosted at Techno again, in which we will cover everything, and everyone attending will be able to leave with a painted sample for their showroom wall! It promises to be action packed for sure. As soon as we come up with some times and dates, I'll post here. I want to say thanks again to Roy, Dee and Ken at Techno for an amazing day. I love going to your place! But were going to show the demo sign we did at Techno, and the painting steps involved to bring it to life. Then we'll ship it down to them so they can hang it up! We got to the shop pretty early to cast up the painful mold of my hand we finished yesterday! The redness on my arm was gone today from the instant hair removal. Gone, but not forgotten. We did the pour in six stages per hand. There is undercuts everywhere in the mold, and I don't think we would be able to get all the air out of the mold in one shot. We slush cast each pour as we went. 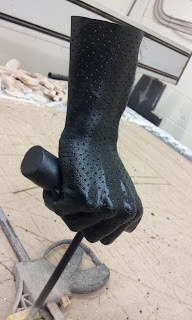 We had zero air bubbles in the final cast. This sometimes can be a surprise, cause you never really know with a mold that has this many air-trapping pockets. The seam up the arm was not really much more than a bit of flashing, the alignment on the rubber was really good. 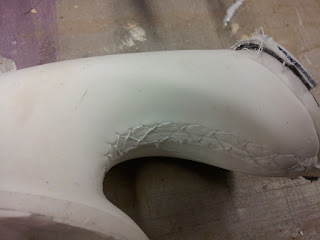 It wasn't until we had a cast part that I was able to physically see the reason for my painful de-molding experience! It seems the resin was strong enough to pull any of the hairs in the rubber mold right back out, and place them perfectly into the casting. Sorta gross really. 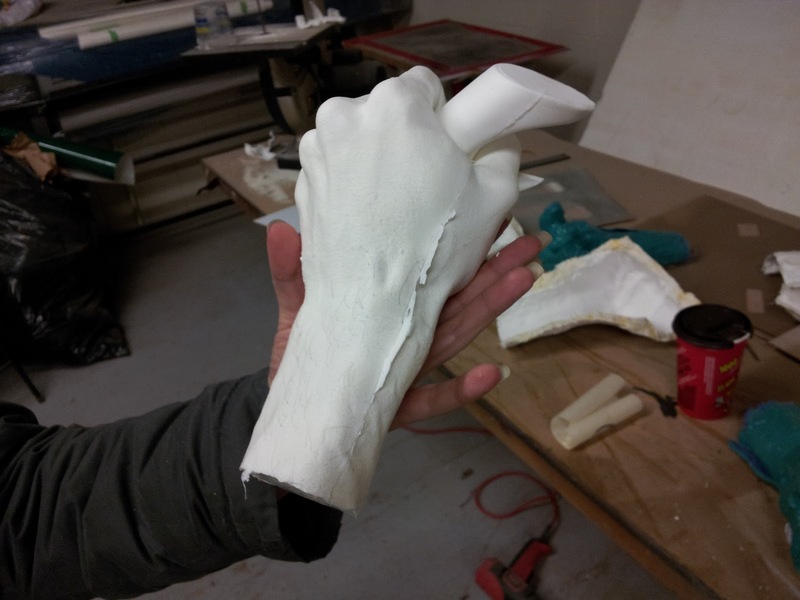 The next step of the build was to "meld" the hand and steering wheel into 1 object, so the hand and car become "one" We used epoxy putty for this step, as the working time is fairly decent, and it's extremely versatile. 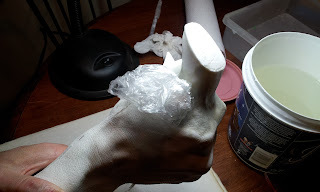 Once we were happy with the overall shape of the "meld", I used crumpled plastic wrap to add the fine surface texture of skin. We let this set up for about 4 hours. Using a Sharpie and a piece of 1/4" masking tape, I was able to lay out all the dimples that are found in the perforated racing leather they wanted. The layout took a very long time! After the layout was complete, we used a small drill bit in a manual drill to dimple the surface. 7 rotations per hole put the depth just right. This took even longer than doing the layout, mixed with the odd hand cramp. Color aside, it's a bit weird to drill an exact duplicate, including hair, of your own hand. Once we were done, it got a thorough cleaning with lacquer thinner, and a long bolt inserted into the "away from camera" side. This will let them mount the hands into grip stands on set. We finished up with a few coats of satin black laquer, and set them aside to dry. Delivery first thing in the AM. As soon as we drop these bad boys off, we're picking up our rental car, and heading down to New York. 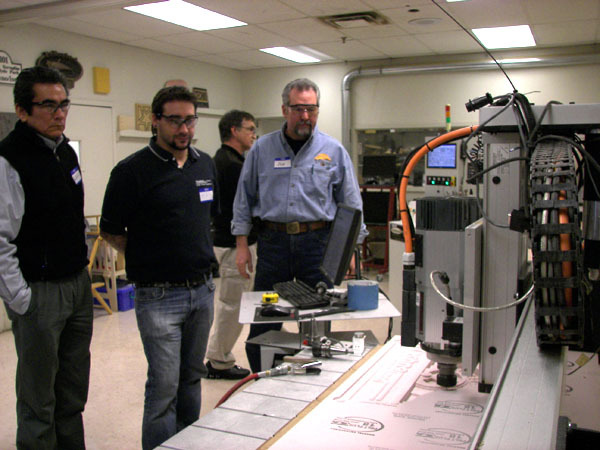 It's going to be great to go back to Techno CNC and see everyone. 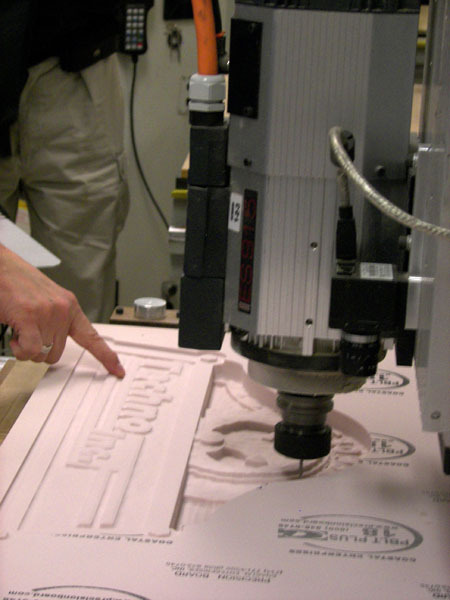 I'm really excited for their cnc sign making demo they're hosting on Friday! Hopefully we'll see you there!! 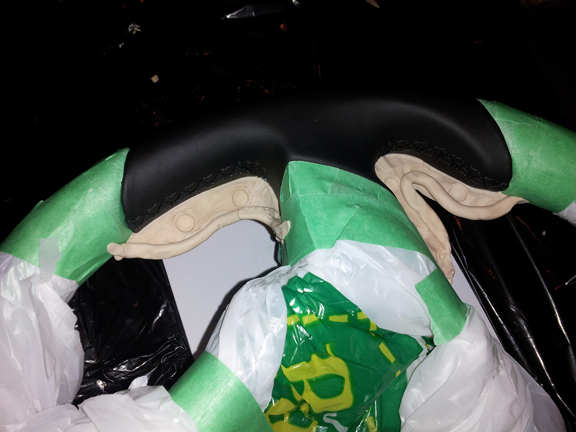 With the steering wheel grips cast and cleaned up, it was on to the next part of the build. I can honestly say that I wasn't excited at all for this part. After spending some alone time with the steering wheel, I was able to determine the angle and grip I would be casting my hand in. I decided that as my hands would be entombed for the better part of the day, we would do this portion at home. That way I could watch tv while the rubber and plaster were curing! We did this the exact same way as we cast the steering wheel portions. 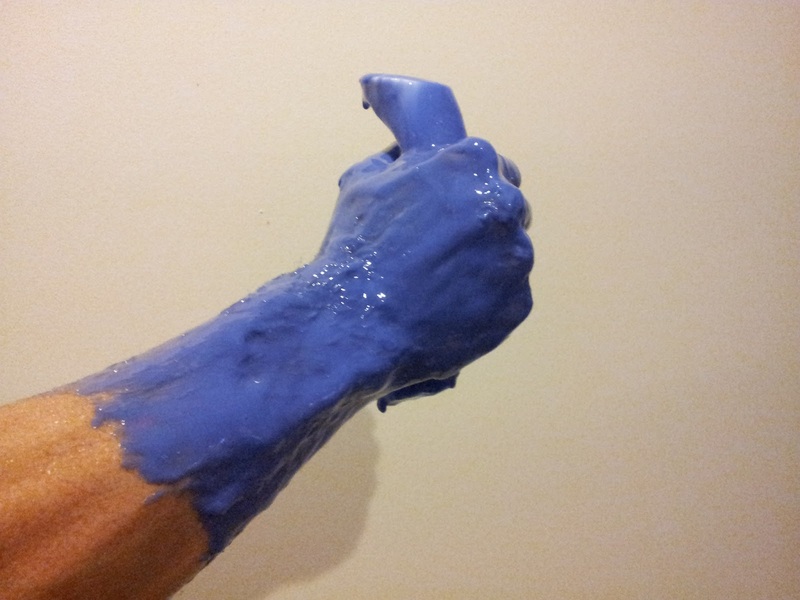 The only difference is that for casting body parts, we had to use liberal amounts of release cream. This helps the rubber come off the skin easily, and keeps all my arm hair intact.................we'll see about that part! 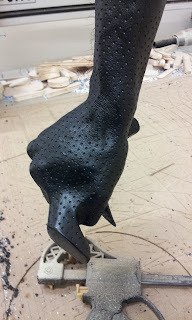 First, the slimy, wet, cold casting rubber got brushed on. 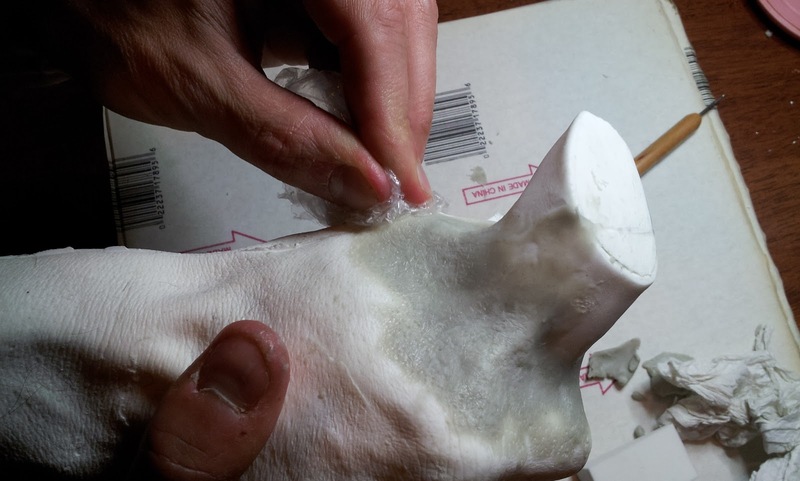 The first coat is always the slower setting silicone, this allows the rubber to pick up the most amount of skin detail. After about ten minutes, Jody brushed on the next 2 coats of the faster set rubber. It's right around this point that I am very aware of how hairy my arms actually are! 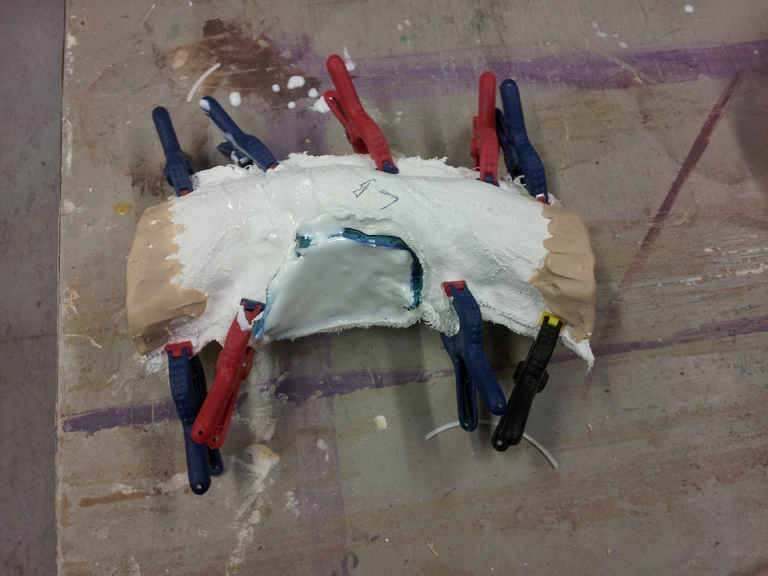 Once all the rubber had set-up, it was onto the plaster jacket. Jody did most of the work, but I was able to help with my left hand. Although I did hear mumbling under her breath as I tried to be helpful. It took awhile for the plaster to set-up well enough to try and remove the jacket. Way longer when you're down one arm, that's for sure. In the end, the jacket came off easily, and we split the rubber off fairly easy. 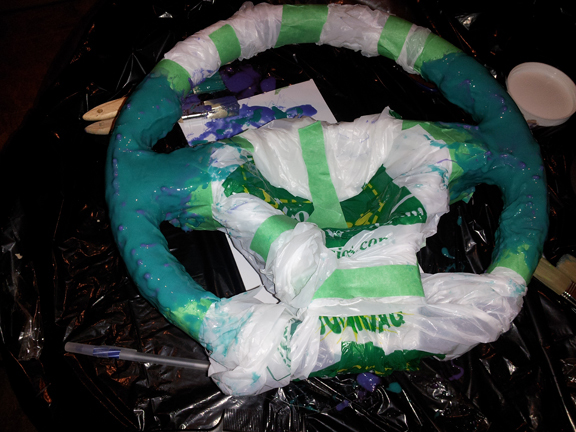 HOWEVER, it was the most painful mold I have ever made. 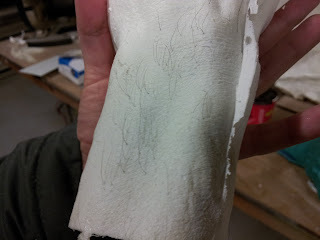 I lost about half my arm hair in the mold rubber. In fact my arms are still really red. So to all the leg waxing ladies in the world...I am truly humbled by your pain thresholds. I never want to do that again. I would shave my arms next time....oh why didn't I shave, why? 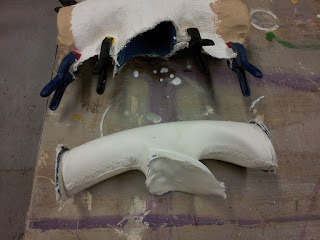 It pretty much took the whole day to make these 2 molds, so tomorrow we'll head back to the shop, and cast these up. I will say the molds look great though.......somebody call the vet, cause these puppies look sick! Our current build is for an ad campaign. I can't mention the the details, but the build is proving to be fun! We basically have to make 2 hands gripping the steering wheel of a car. 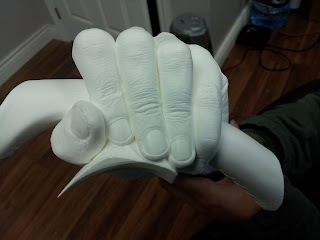 The hands have to meld into the wheel like they are becoming one piece. Cool! We only have to fabricate the hands and the leather wrapped portions of the steering wheel. The rest of the wheel will be comped in to the existing interior I think. 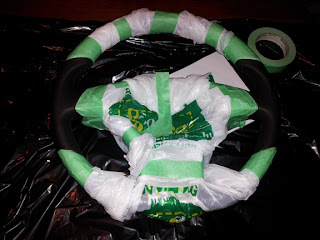 In the beginning, I was going to model and machine the 2 sections of the steering wheel, but we were able to get the proper steering wheel that's going to be used. 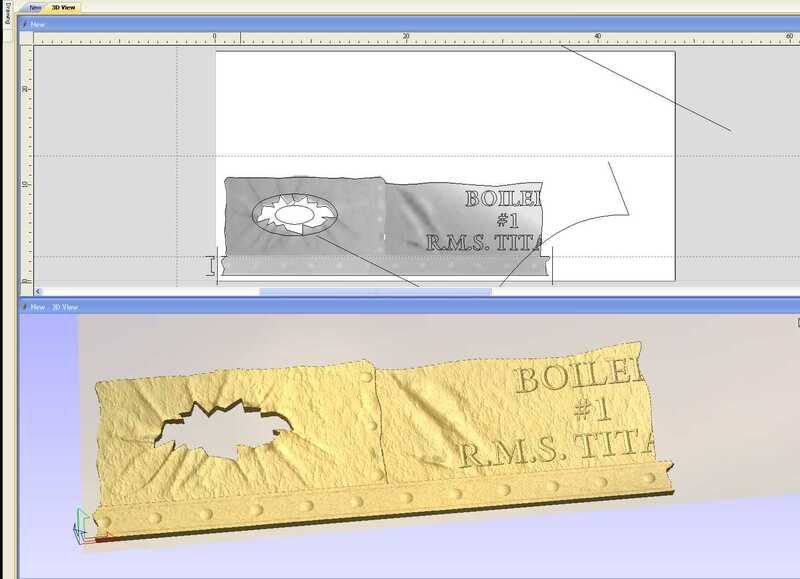 It's always best when we can get the actual part someone needs! I imagine that this wheel is fairly expensive, so we certainly don't want to damage it! I started off by masking the grip portions that we're interested in. The great part is that there is a natural seam line right at the part we need, so this makes things even better! We carefully masked off the rest of the wheel. 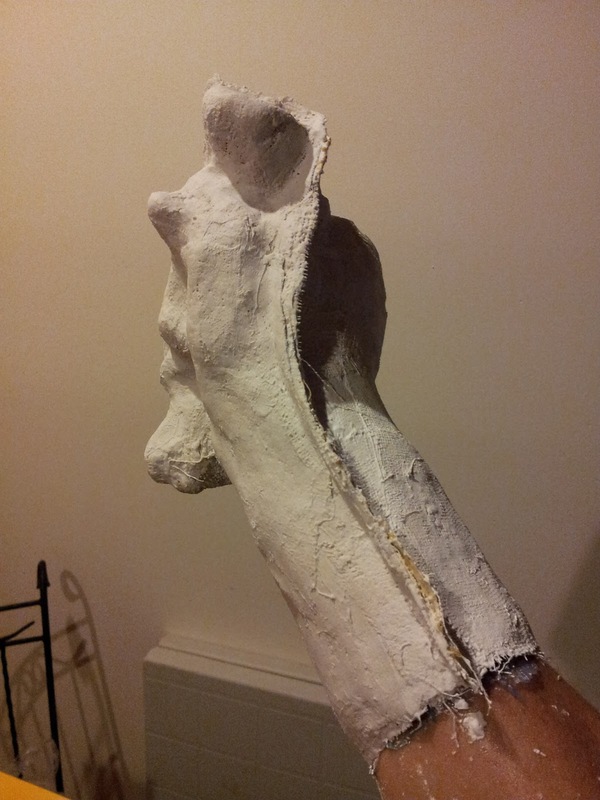 We will be using plaster bandages for this, and I didn't want to get any plaster on the wheel. We started out by using some sulpher-free soft clay to create a mold flange on the inside of the wheel. Although in a last minute decision, we scrapped this idea and decided to just coat the whole piece, an cut the rubber off after we were done. 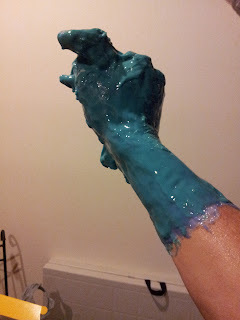 Then it was off to the really messy task of brushing on the silicone rubber. We actually used 2 different rubbers for this. The first thin coat was done with a rubber that has a 10 minute kick time, then we backed it up with 2 coats of a 90 second rubber. The 90 second stuff was quite a bit more viscous and thus went on really thick, building up the rubber thickness pretty fast! We let it set up for around 30 minutes. 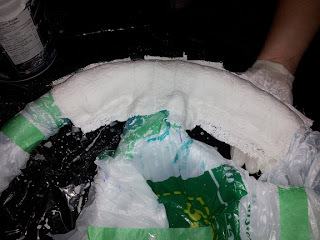 The next step was to create the mold jacket. 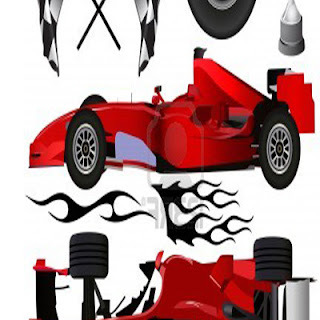 The whole point of the jacket is to add some rigidity to the very flexible rubber portion. 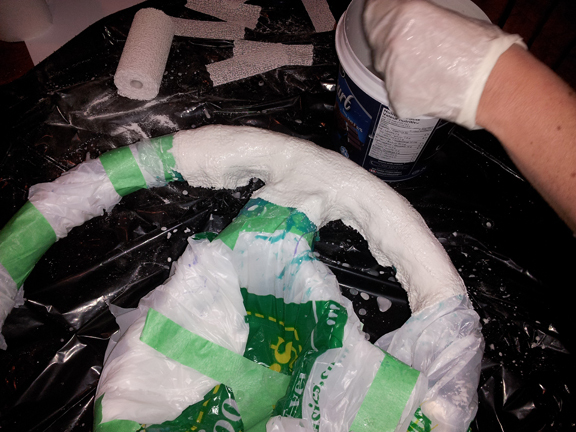 We kept adding quite a few layers of the plaster cloth, while creating a flange right around the center of the wheel. Once the tops of both sides where done, we flipped the wheel over, greased the flange with release cream, and plastered up the back side. This will allow us to separate the mold jacket from the wheel, then clam-shell the rubber portion back inside at casting time. We decided to wait until Sunday morning before we popped the plaster off, letting it dry out as much as possible. Once we popped it apart, we carefully split the rubber off the wheel with an X-acto knife. The inside of the mold looked great! And with brushing the rubber on, we had no air bubbles. 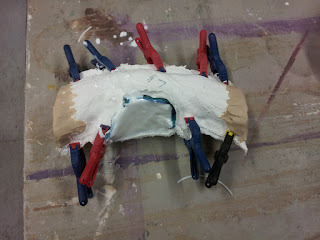 With the mold all re-assembled and clamped, we dammed up the two ends with clay, then slush cast the inside of the mold. 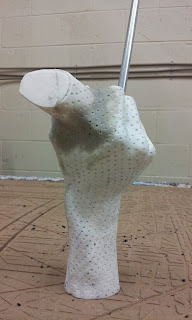 The slush cast process really just means that we rolled the resin around inside the mold. This coats all the walls of the mold in resin. 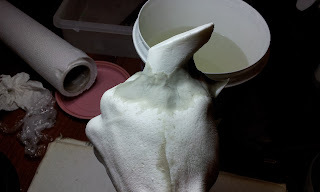 That way, if there is any trapped air when we do the fill pour, it won't affect the casting. I doubt the mold jacket will take much abuse, so I plan on doing this once! The final cast came out great! There is a seam up the middle, but my hand will be covering most of it, so there will be very little cleanup in the end. The mold captured all the stitching detail perfectly Any where the seam was seems like it will be covered anyway! Who's Awesome? You Guys, That's who! First off, I need to thank every one of you who takes the time to read our blog! THANK YOU! Today marks the 2nd year we've been posting here, and without you guys reading it, we wouldn't be doing it. So again, you guys drive this, and I thank you! Jody and I will be down at Techno cnc routers on Friday March 15, in New York. 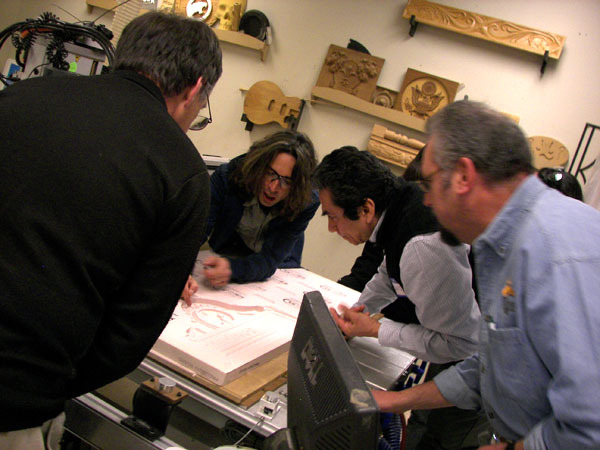 They're having a free CNC signmaking seminar, and we've been asked to come down and share some cnc tips and tricks! I hope to see some of you guys there! They will be demo-ing some of their cnc routers for everyone to check out. We decided at the last minute to escape the relentless cold, and head to Cozumel, Mexico for a week. It was amazing as always! The weather was perfect. I did work a bit while we were away. Jody would go to the gym every morning, and I took that time to work on a writing a couple of magazine articles. So the above picture became my morning office for the week using our tablet. We also spent a lot of time on this dive boat. Again, the sun was amazing! These were some other shots that we grabbed while we were away. Man, I'm going to retire to Mexico, at least for the winter months! Canada is amazing in the summer, but I think the winter belongs to Mexico. We are starting a cool build on Monday, there won't be any cnc work on it, it's all casting and mold making. But it's gonna be cool! We're also in the process of releasing some of our own products in the near future, so we're pretty stoked to be able to get to work with a few companies on that stuff. I will gladly post about them when we're ready to launch! Thanks again everyone, this has been an awesome adventure!